Daniel Zemans and first-time hunter John Lenart stealthily approach their prey. 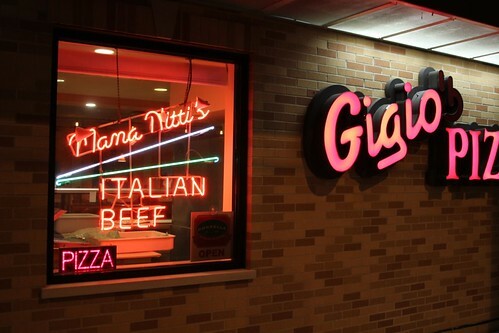 When Daniel Zemans and I started hunting for Great Unknown Pizzas, part of the point was to see if there was a pizza as good as a Vito & Nick’s or Pat’s Pizza that had gone unknown to the city beyond its own immediate area. But another point was to search out a certain kind of pizza. 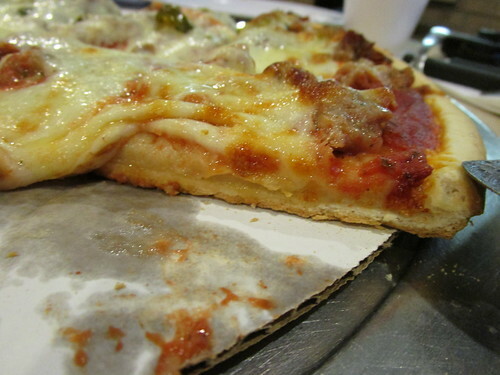 When thin crust pizza started in America, it tended to be the very thin, cracker-like crust. A simple pie. But over time big pizza chains realized that they could fill their customers more cheaply by selling pizzas that loaded up on the cheapest part— bread— relative to the more expensive parts like cheese and meat or vegetables. So the pizza we liked finding best was at the place that started making it the old way in the 50s or 60s, and never stopped, never followed the siren call of Domino’s’ or Pizza Hut pan pizza’s profitability at selling spongy bread topped with cheap toppings. As it turned out this latest excursion would demonstrate both sides of this theory of pizza history in spades. 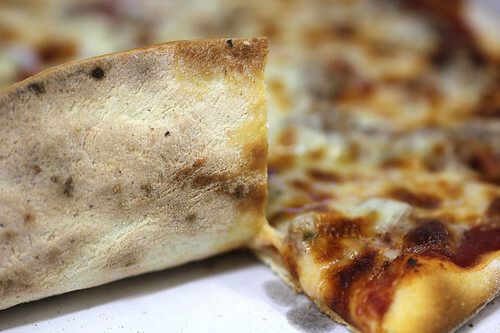 Two pizzas adhered to the origins of American pizza— and one sold us a whole lot of bread. Our modus operandi is to order thin crust sausage, thin crust because it’s more common and takes less time, sausage because it best shows off the skills or tastes of the restaurant, if they make it themselves or even if it merely shows their own taste preferences and the level of quality they’re willing to pay for… Our main method for identifying them is simply searching Yelp for ones that give off clues that they might be promising. 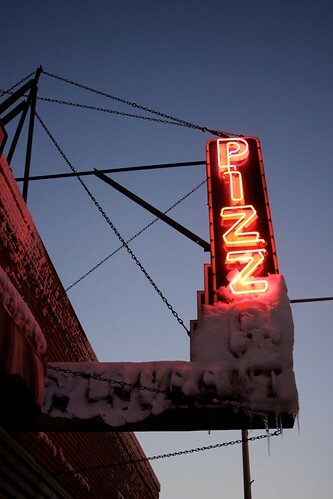 Every pizza place has somebody calling it the best pizza in the world, that doesn’t tell us anything; we’re more interested in comments that a place makes its own sausage or does something else that gives a clue that there’s blue-collar craftsmanship at work here. Zemans raised the question of whether this place was a worthy contender based on a photo at Yelp indicating the use of a conveyor belt oven, a la the Pizza Hut inside Target. 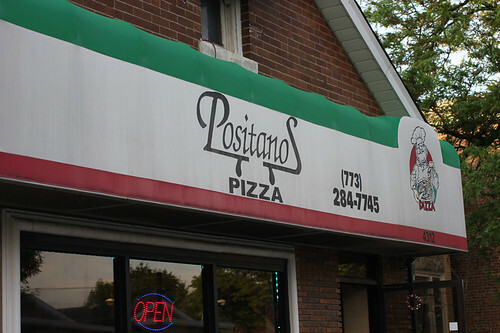 But I was sold by this line in a review: “If you park out front on La Grange road, you literally have to walk through an alley to get here.” Any pizza place that can survive being hidden from normal traffic has got to be good, right? 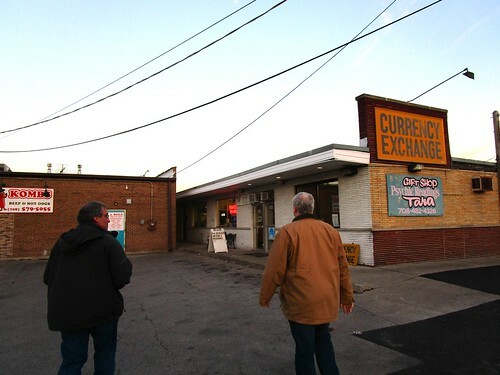 So we got to 55th and LaGrange and we saw a Mexican restaurant called Cocula (this is when we really regretted Dennis Lee declining to come along on this one) which is supposed to be what it’s behind. We found the alley and, eventually, tiny little Pisa Pizza next to the currency exchange. 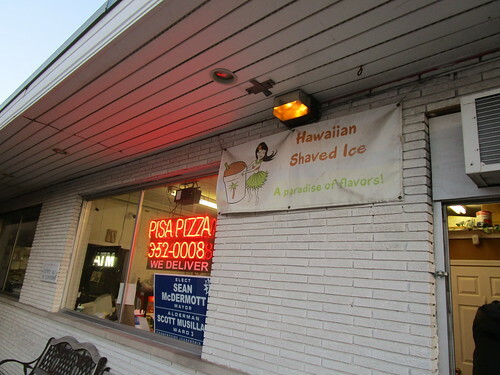 The owner was older and a bit brusque at first, but maybe our irrepressible enthusiasm warmed him up as we asked about the surprisingly large array of desserts he has for a hole in the wall pizza place. 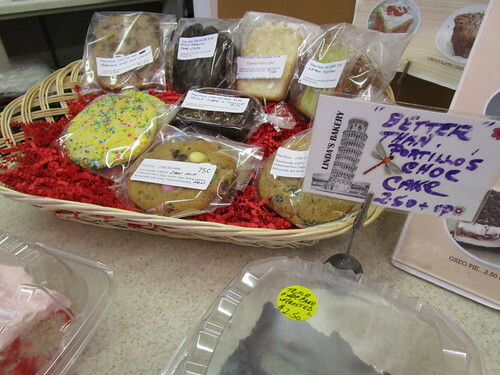 They were all made by his wife, but he doesn’t eat them— or pizza, either, these days, as he’s trying to drop some weight. There was a copy of a magazine called Clean Living on a table, as if to drive home the point of his despair. Twelve minutes later we took the pizza out to the hood of John’s car. Zemans said, skepticism audibly dissolving, “It looks pretty good!” It was also flaming hot, having come out of the oven 45 seconds earlier, but we started taking its picture and evaluating its conveyor belt crust. The rippled bottom showed it sat in a pan to go through the conveyor and wasn’t as crisped up as if it had gone in a classic Foulds oven, but as we tasted it it was surprising how good the pizza was. 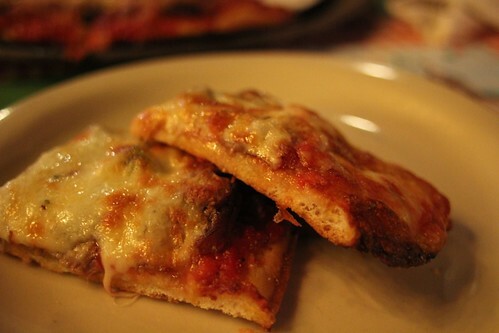 The crust had a nice double texture— a little exterior crispness, then fluffy and bready— and the stuff on it was all quite good, great sausage with strong fennel flavor, a nice basic tomato sauce and high quality cheese, very handsomely browned. We were very happy with this pizza, the kind it takes a solid local pizza culture to create, and we had to make a conscious effort to stop scarfing it all down to save room for the next two. 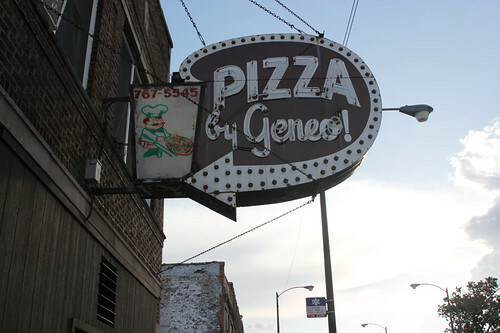 But already this Great Unknown Pizza quest had a first-tier contender, and had proven the worth of this obscure suburb. So we’d had a hit in Countryside and from the parking lot we could see another Countryside pizza place, Ledo’s, across 55th, while a third was supposed to be just up the street. Maybe Countryside was a great unknown pizza destination! 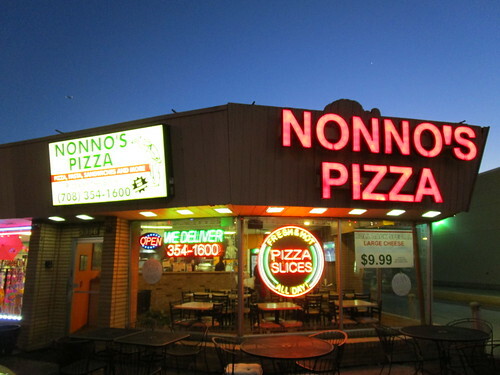 Looking over the Yelp reviews quickly, Ledo’s did not seem that exciting, but Nonno’s, second outpost of a Berwyn pizza place*, had solid reviews. Heady with the prospect of discovering an entire town, we zipped two blocks up LaGrange Road and pulled in to the neon-lit establishment. In doing so, we ignored the sign (scrawled, of course, on a round piece of pizza cardboard) that said “Pizza Maker Wanted.” We also ignored the actual pizza slices in the heater thing, which clearly showed a pizza with too much bread, until we’d already ordered our own half sausage/half Italian beef (hey, it was a place that advertised its Italian beef sandwich— so it had to be good!) We’d done such a good job of convincing ourselves it had to be special that we walked right past the clear signs that it wouldn’t be. 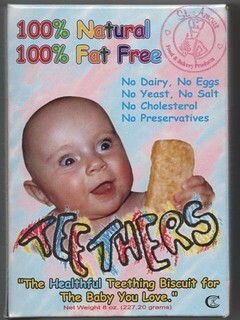 Being so out of balance, it smothered the flavor of everything else; every bite tasted like you were eating an entire box of teething biscuits, the thick cheese in the middle was so shielded from the heat of the oven that it was barely melted. It was like eating pizza toppings on a Sealy Posturepedic. This was a pizza so heavy that when I set two pieces in a to-go container I was holding (not that we really wanted it, but you hate to visibly waste it), the styrofoam immediately gave under the weight. Good prep for a life of eating this pizza. They were nice folks, but if this was a good neighborhood pizza once, it took a wrong turn at some point, and the positive Yelp reviews were clearly from people who just wanted to be filled up and didn’t care how. 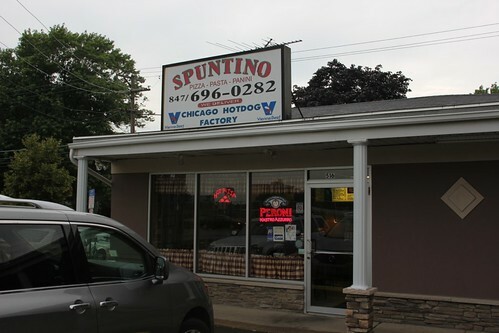 * The Berwyn location is surely why Nonno’s is the only one of our three obscure-suburb spots to have ever gotten even an ancient mention on LTHForum, though interestingly, Jennifer Olvera sang the praises of a hot dog stand we saw across the street on Serious Eats. As the story was told to us, Chester’s was a bar for forever in little, very industrial Summit Argo, and Orsi’s was a family run Italian joint a few doors up, and at some point the third generation of Chester’s was ready to close it and the dad of the current Orsi bought it and merged the two businesses, so now it’s a bar and it has a pizza kitchen in the back. 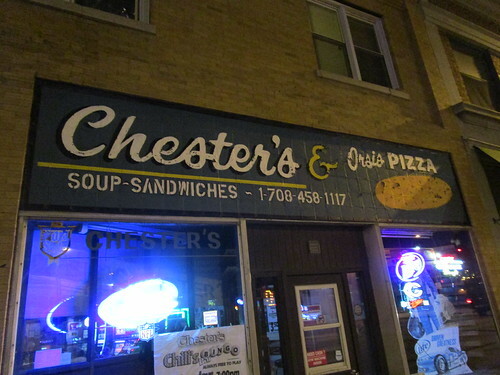 I was sold on this one by an entire post at Yelp which claimed that Chester’s was once an Outfit hangout, certainly possible in the bad old days given our proximity to Cicero. But on this Tuesday night, all Chester’s was was a dive bar with some video poker and cheerfully rowdy guys on one side, and a side room which you could have taken the family to on the other side, and a couple of nice folks running it who were proud to tell us all about it once they understood that we were on a mission from the Pizza Gods and that we pretty much loved their place. Anyway, we ordered beer and, noticing a (round cardboard) sign that they sold frozen pizzas, asked nervously if they were still serving fresh ones. “He’s about to shut it down,” the bartendress told us, so I blurted out “large sausage” and we got our order in as we watched the Sox to the tune of the heavy metal the regulars put on, which got an eye roll from the bartendress. And it lived up to it. 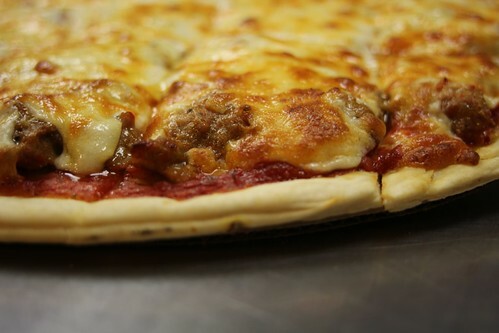 Good sausage and cheese, a simple sauce that had a little bit of neckbone-gravy caramelization flavor to it, and that great, shatter-in-pieces-in-your-mouth crust. For me, this was one of the two best we’ve tried (along with Pizza Castle in GUP #1) and an instant candidate for the next time I do a Best Thin Crust list. Zemans interestingly made his case for preferring Pisa slightly, and it’s true that the sausage was the best there, which is no small thing, but mainly he made the pronouncement that this was the first quest to date where two out of three were top tier, and I have to agree. (I think John agreed in general, too, even though this was his first outing.) 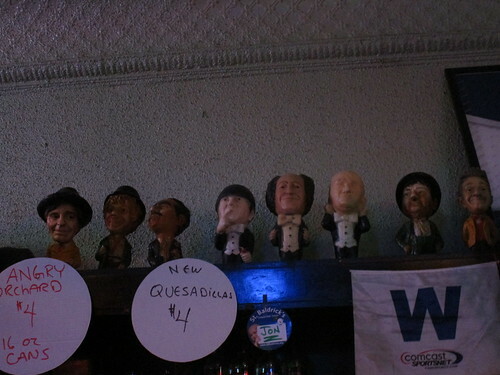 Chester’s/Orsi’s, not too far past Midway, next time you’re way way down that way, check it out. This time we (Zemans, me and fellow Serious Eats contributor Dennis Lee) decided to try the suburbs straight south of the city— literally across the street from the city in one case. For me part of the point was to finally hit one of the places that inspired this kind of quest when I spotted it years ago. 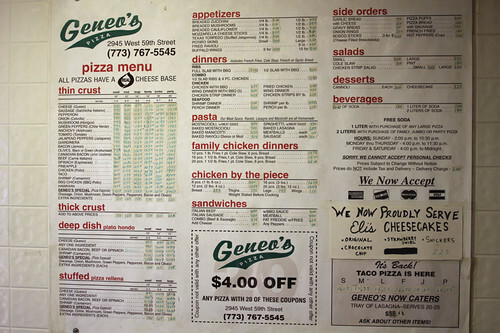 I didn’t go to Roseangela’s in Evergreen Park then because I went here instead. But nine years later I was determined to go. Otherwise there was an embarrassment of riches in this area, and once we narrowed it down to six roughly along 95th between Beverly and Oak Lawn— Roseangela’s, Fox’s, Palermo’s, Phil’s, Barraco’s and Nino’s in Alsip— we pretty much just chose the final three randomly (or because Zemans had already been to a couple). So don’t say “Why didn’t you go to X, it’s great!” We know that. We may hit the other three some other time. These are the three we hit this time. 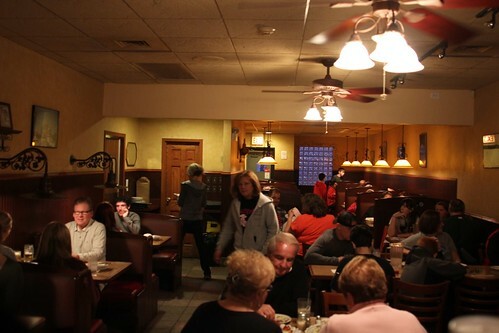 Roseangela’s in the suburb of Evergreen Park at 95th and California has been around since 1955, and on this Thursday night it was doing a business; we’ve never run the risk of having a long wait to eat at one of these places before. Fortunately it was possible to order for takeout and then wait in line, so we sat down minutes before our pizza came out. 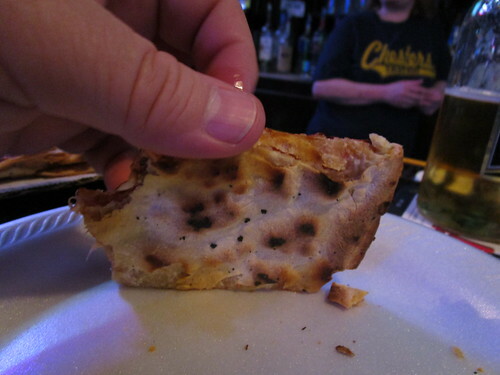 I remember being perplexed in the early days of Chowhound by mentions of “cracker crust” Chicago pizza, vs. “foldable” New York thin. 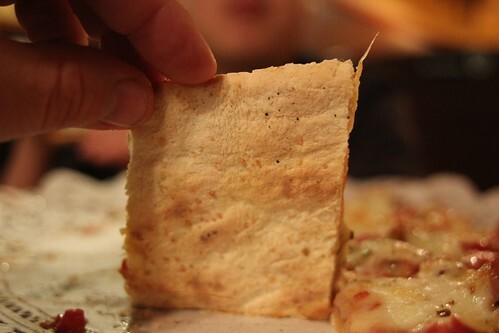 I had had Chicago thin but it was usually thicker and doughier than this; this is a true cracker crust, in both flavor and texture a spot-on double for a Saltine cracker. 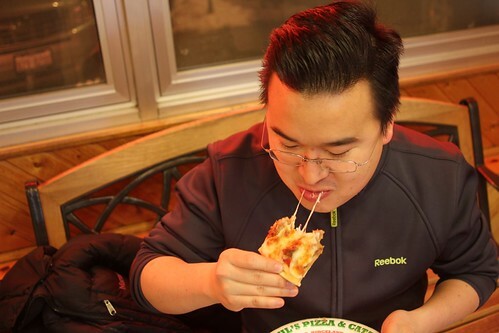 In other words, it didn’t really have any flavor— like tendon in Chinese soup, texture was everything, and it was a perfect crackly base for a super-thin pizza. 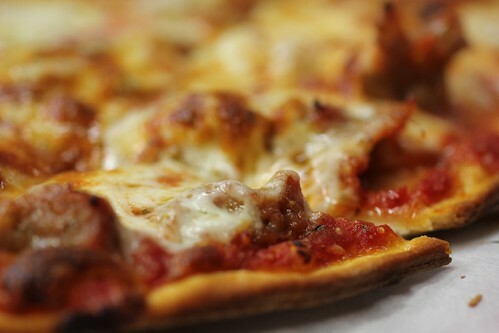 The tomato sauce was tomato sauce straight from the can, the sausage didn’t have much flavor besides pork and salt, but was high quality and satisfying, and the cheese was maybe a little heavy for old school pizza, but certainly within range. Sometimes the highest praise you can give is “there’s nothing wrong with it,” which doesn’t sound all that much of a compliment, but it is one: this is a textbook example of its style in every department, we were very happy with it and agreed we would order it if we lived near it… but kind of feared that the evening had peaked with the first and would only go downhill from there. We didn’t have much hope for it when it came out of the oven, it looked like pretty generic pizza designed to fill you on bread, much like Positano’s in the first installment, but I have to say that even if it wasn’t our style, it was better than the sum of its parts, especially thanks to excellent sausage. Between the ingredients and the very friendly, obviously conscientious service, you could see why everybody who grew up on it loves it and has kept it in business all these years. Dennis attempts a cheese pull. 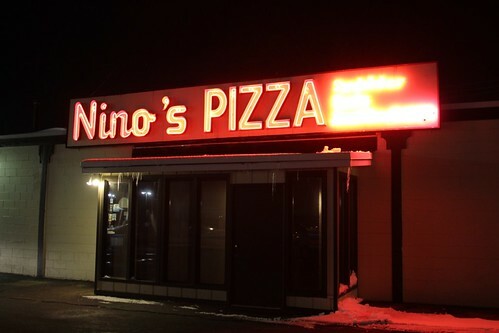 I picked Nino’s in Alsip just because nobody beyond a few Yelpers ever seemed to have heard of it, compared to our others which seemed at least somewhat known. 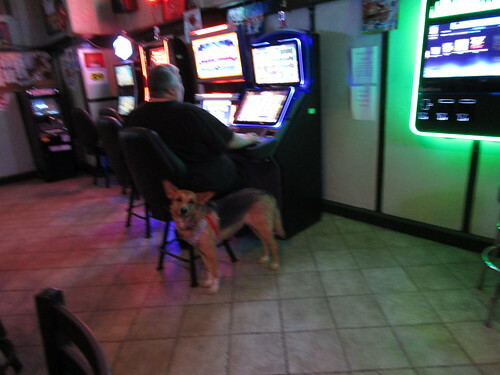 (Turned out there was a story about it in the Sun-Times 5 years ago, based on the fact that the dad was still running it in his 80s— he has since passed away— while the son ran Lettuce Entertain You’s Frankie’s Scallopine downtown.) 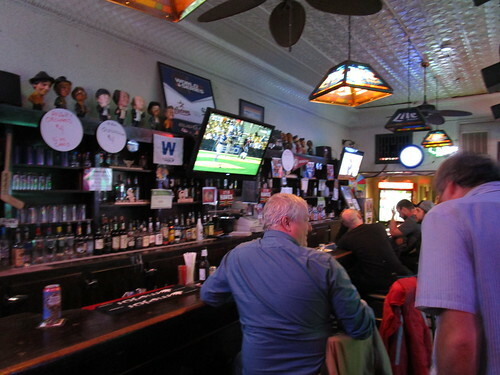 We thought we’d arrived too late for it, as they were mopping and vacuuming, but they proved to be very accommodating about not only letting us in but letting us order deep dish as well as thin before the kitchen closed. WAIT, DEEP DISH? you cry. Yes, deep dish, violating the primary tenet of our past investigations, which is that deep dish is north side pizza and south side is thin. 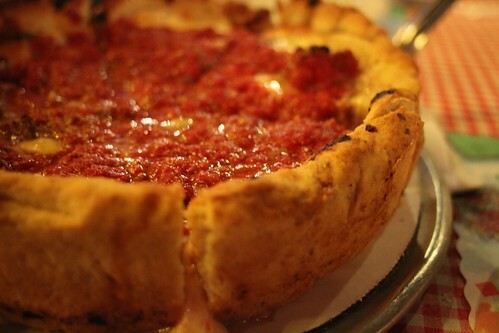 (Never mind that Giordano’s started on 63rd.) Zemans interrogated the waitress to see if we should really go there, and when she described the crust (the same as the thin, just pushed up into the deeper pan) he was pretty much unsold, thinking that the crust would be uninteresting. But then she came back and really advocated it the way she likes it, and we believed that she knew what she was talking about because earlier we were expressing puzzlement at a news story on a rash of catalytic converter thefts affecting the south side and she responded with a detailed and convincing account of the catalytic converter theft racket (it’s the platinum they’re after). So we ordered a sausage deep dish, and, for variety, an Italian beef and giardinera thin (she suggested double sauce for that, pointing out along the way the fact that the thin and the deep had different sauces). Again the thin looked breadier and cheesier than it probably was when they opened years ago. I suspect in all of these cases, being in the suburbs has forced them, or simply encouraged them, over time to up the cheese to fit the idea of pizza that people have gotten from chain restaurants in the area (which is very built up, retail-wise); the ones on our first expedition in the city, where retail activity is much lower and fairly chain-free, haven’t dialed it up as much and consequently are closer to the fairly modest pizzas of the 1950s and 1960s. That’s my theory anyway. The other thing about the sauce was that it was very sweet, almost shockingly so; words like ketchup and barbecue sauce were tossed around. We were glad we had the giardinera on ours to cut that aspect of it. Then the deep dish came. 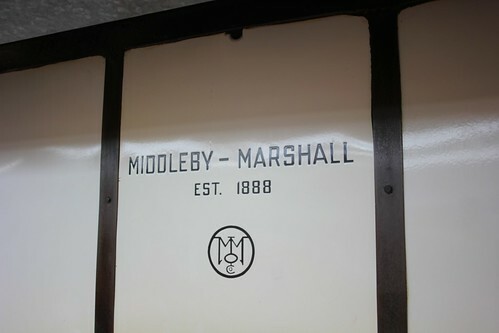 We were wowed by this thing, impressive as a crown roast, with its walls of dough surrounding the interior. Yes, it was the same crust, but it was a whole different thing folded into a thick dam of breadiness, too much bread to eat but fun to pull apart, releasing steam and offering the satisfaction of homebaked bread. 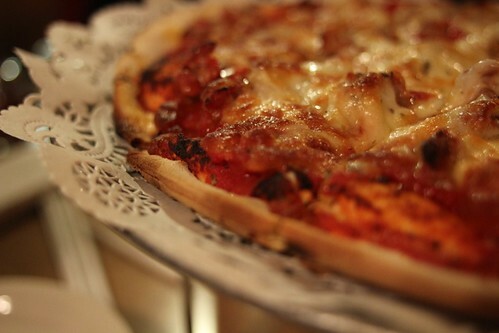 There was a rough-hewn, homemade quality to this deep dish pizza that was instantly charming compared to the machine-round pizzas you almost always see. 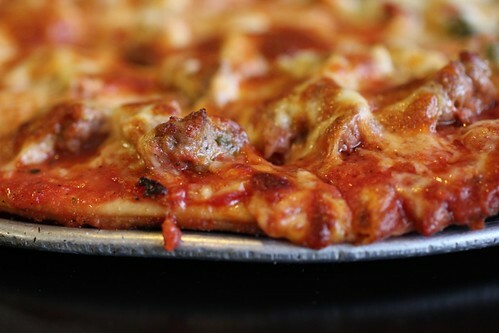 And the sausage was terrific— still light on fennel but bright and meaty and cravable, while the sauce was acidic crushed tomatoes, totally different from the sweet sauce on the thin crust. Zemans was still shaking his head at what the hell deep dish was doing here, but we all three loved it and agreed it was one of the best of its type to be had in the city, anywhere. 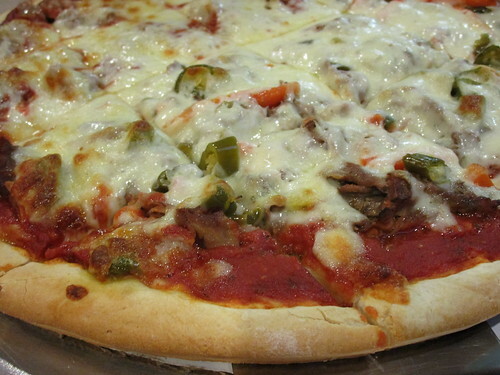 Our conclusions: this is a major pizza region within Chicago, tied to its south side heritage but diverging from what it might have been 40 or 50 years ago in several significant ways, notably that the cheese is piled on much thicker. Sausage is taken seriously, even though none of them had the fennel that you take as a defining characteristic of Chicago sausage (and sets it apart from the breakfasty sausage crumble that’s typical in the rest of the country). Which of course means, maybe it isn’t one, nearly as much as we thought. And lastly, everybody was just so darn nice, that suburban niceness, even when they were literally 20 feet from the city in Roseangela’s case. A satisfying and revealing expedition— but the search will continue. 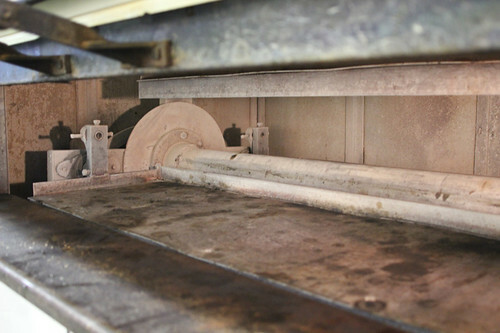 The classic Chicago pizza oven: a Faulds oven. No longer made, you have to keep yours up and running by cannibalizing parts from others. The great thing about food on the internet is that if you publicize something, lots of people wind up going to the same place. The bad thing is, lots of people wind up going to the same place… and never check out other places that might be good, too. 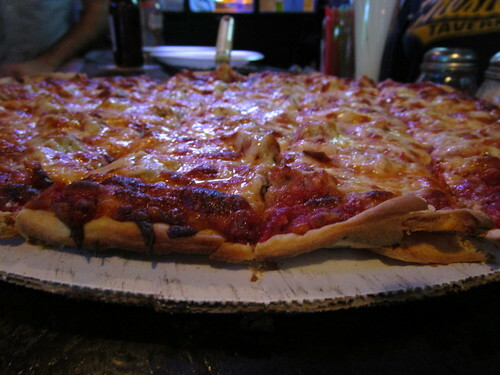 This is especially true for certain iconic foods whose definitions are pretty clear— you could know Vito & Nick’s alone, say, and claim that you had a pretty good handle on old school Chicago thin crust pizza, such as is typically found all over the south side. In fact, that’s pretty much exactly where I was on the subject. 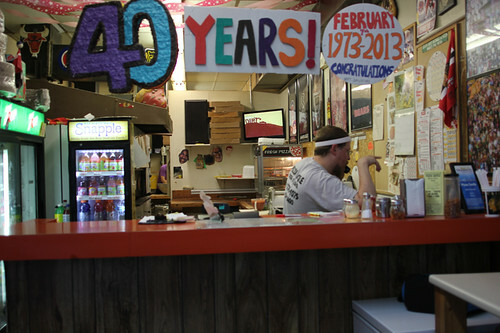 Longevity is a good sign in a pizza joint. How did we choose these three? 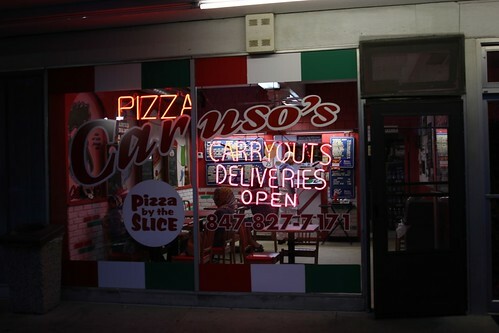 We focused on a specific area— they’re all within a narrow corridor in the western section of Gage Park/West Elsdon, a once-white-ethnic, now mostly Latino section of town straight east of Midway Airport, the kind of neighborhood that should still have old pizza joints around. And we searched Yelp for clues, ignoring the typical Yelp hyperbole for signs that suggested a cut above— like that they made their own sausage, say. 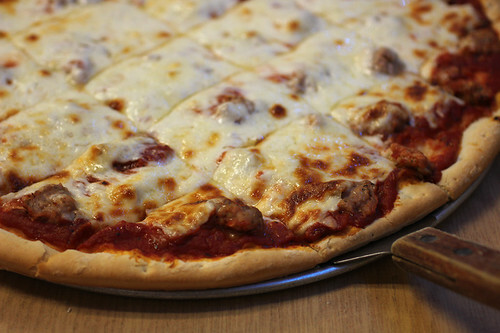 Anyway, we narrowed it to three, and settled on a single dish for all three— thin crust with sausage. (The thought there is that sausage is the meat which most shows the taste preferences and philosophy of the owner, versus meats like pepperoni which tend to be ordered somewhat generically and are also common around the country. 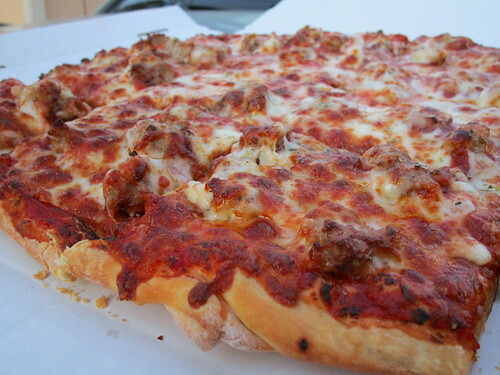 Chicago pizza sausage is a fairly unique thing, fat little wads of ground pork heavily spiced with fennel, very different from the crumbled breakfast-style sausage which most of America eats on pizza.) Here’s what we found. All three of the places we tried had enormous menus like this, full of things which surely would go straight from many months of deep-frozen sleep to a fryer if you ordered them. We stuck to pizza, even as we were fascinated by cryptic offerings like the Fat Freddie sandwich (their version of this) or Bosco Sticks, whatever those are. 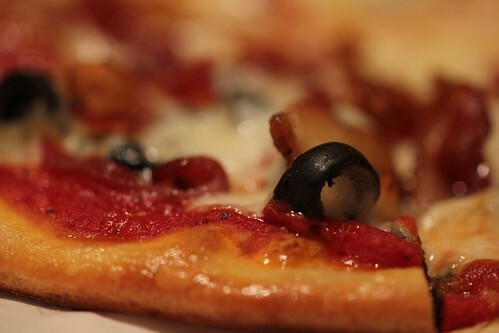 Anyway, 20 minutes pass and we take the pizza to my car parked across the street and dine al hatchbacko. The pizza is maybe just a little thicker than we wish, certainly thicker than Zemans (whose perfect pizza crust is Pat’s ultra thin) wishes. Still, it has a nice Saltine-cracker taste like a pretty good Chicago thin. As for what’s on it— plain, straightforward tomato sauce; pretty good sausage with noticeable fennel; good quality cheese that doesn’t taste like the glue factory— for the price, about $11, this is quite a good neighborhood pizza. 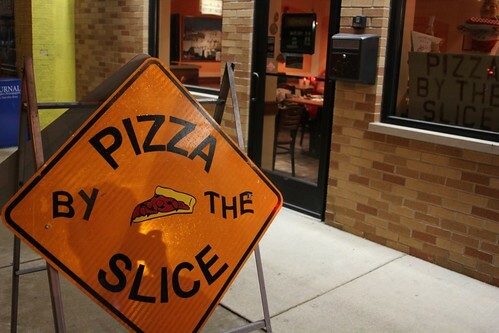 But we both agree it’s not a drive-all-the-way-to-the-south-side good pizza, and I can taste the things I’d do to brighten and heighten it (like introduce it to the taste of garlic, somewhere). 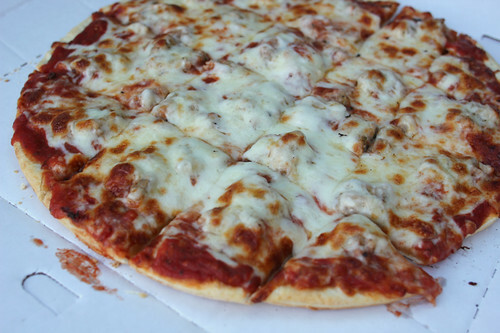 If it’s what you grew up on, it’s still good, but it’s not noticeably different from a pizza near you almost anywhere in Chicago. 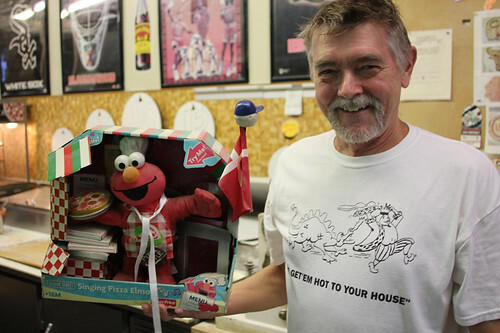 A photo similar to the one above at Yelp nearly scared me off Pizza Castle, making it look like a mattress store having a going out of business sale. Only the claim of housemade sausage kept them in the running. But 30 seconds inside this place, we both knew that it was the gem of the night. 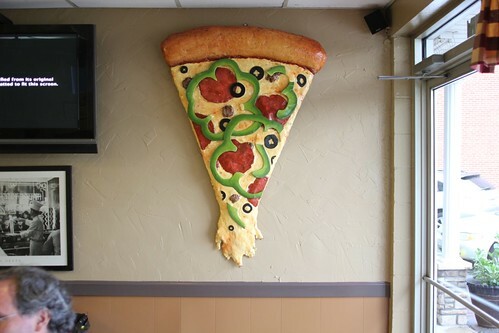 The walls are covered with photos of kids in Halloween costumes— literally thousands of them; for decades Pizza Castle has handed little squares of pizza to trick or treaters, and they get kids from all over the south side now, lined up for a block for two bites of pizza and their picture to be taken. About ten seconds of chitchat from Zemans produced a photo of owner Rich Jensen, much younger and 70s-haired, posed with Cubs Hall of Fame pitcher Fergie Jenkins. A little more produced the information that he was, somehow in this old Slavic turned Latino neighborhood, of Danish extraction, the business started by his Danish parents who belonged to a long-gone community of South Side Danes. The Danish flag decorates Singing Pizza Elmo. 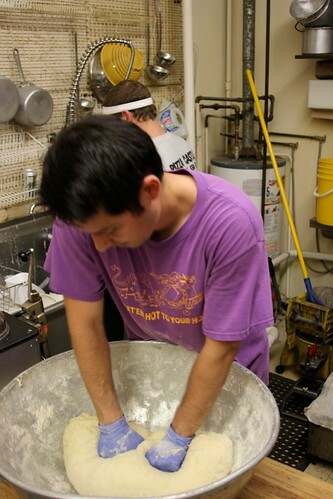 “That’s not dust, it’s pizza flour!” he points out. 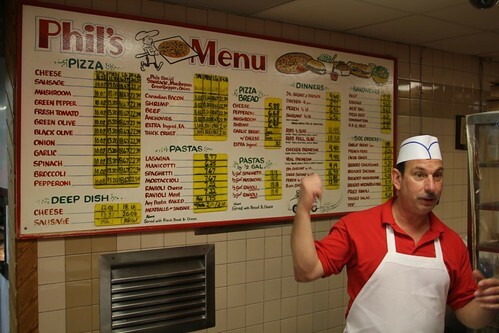 We’re inquisitive enough that he asks us if we’re from out of town and we explain no, but from far enough away on the north side that we might as well be, and that we’re on a pizza tour. He quickly explains that his shop does things the old-fashioned way— rolls its own dough, grinds and seasons its own sausage, and so on. 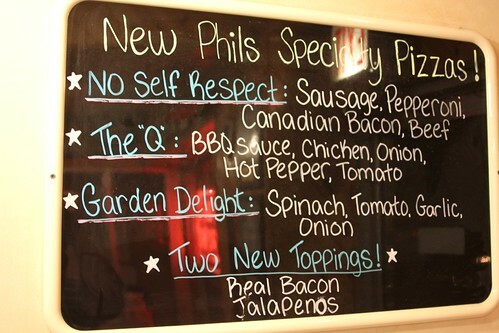 He’s trying to be self-deprecating about it and not seem like he’s bragging (“It’s how we’ve always done it, so we just do”) but he soon gets to the heart of the matter — “If we opened this place now, we’d just call up and order everything [premade], and ours would taste just like everybody else’s pizza and we’d go out of business in a year.” He’s reluctant to outright brag, but he knows exactly why his unassuming place is treasured by its community. 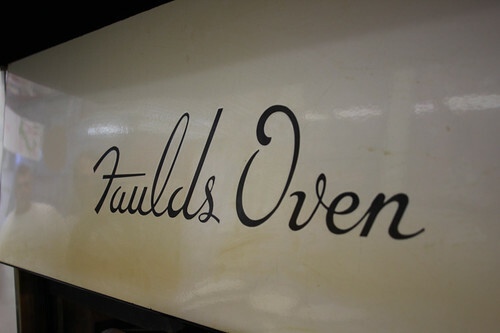 If the inside of this Faulds oven looks familiar, check about 26 minutes into this Sky Full of Bacon video. So we’ll brag for him. This is a completely admirable pizza, one I’d drive a considerable way (from Hyde Park, say) for. The thin crust gets crisp on the bottom and caramelizes the cheese on top in a way the previous two, thicker pizzas could not. The sausage and sauce are both brighter and tastier than what we’d had before. We weren’t exactly full when we came in but we had eaten enough that we didn’t expect to finish this pizza— but in fact that’s just what we did, a bit painfully but not sorry that we did so. I’m not going to claim that we toppled the South Side crown from Vito & Nick’s, but whatever south side pizza came in second before (Aurelio’s?) just dropped a rung. 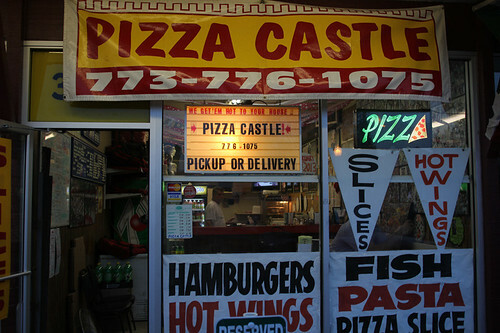 Pizza Castle is easily a discovery good enough to have made the whole night worthwhile. 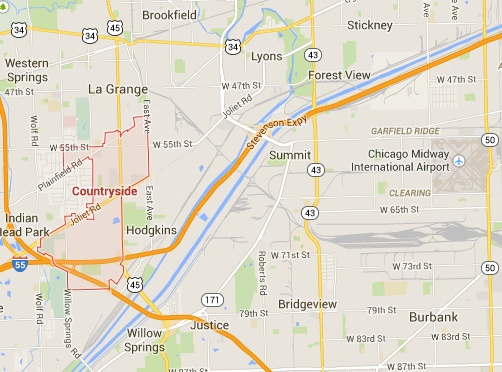 And yet… we’ve only begun with one small neighborhood out of the south side. We pulled a bunch of potential candidates from the Beverly/Evergreen Park vicinity, before deciding to focus further west. Stay tuned for the next exciting episode… sometime.